Noel was the first pet my husband (live in partner at that time) and I got together. She was like our first "baby". I've never been a fan of small dogs and always saw myself with big dogs. My husband and I often discussed getting a Bullmastiff. Ha, jokes on us. Here we ended up with a Chihuahua mix, literally the smallest of small dogs. Noel came to us at 2 years old from a family member who couldn't keep her as they only took her on a temporary basis. We dog sat her for a week and she stole our hearts. Ok, maybe just the heart of my stepdaughter and I. The day she went "home" my stepdaughter tucked her into her crate and I told her to say "goodbye" since we didn't know when we might see her again. We rode the entire ride to her school in silence. I was emotional feeling the entire ride to work, in that short week with us she left such a large imprint on my heart for such a little soul. My husband took Noel back home that day before I even got home from work. He saw me moping around and I told him how I missed that little dog. My husband, "surprised" picked Noel back up the next evening and she's been with us ever since. She turned 7 this past October. 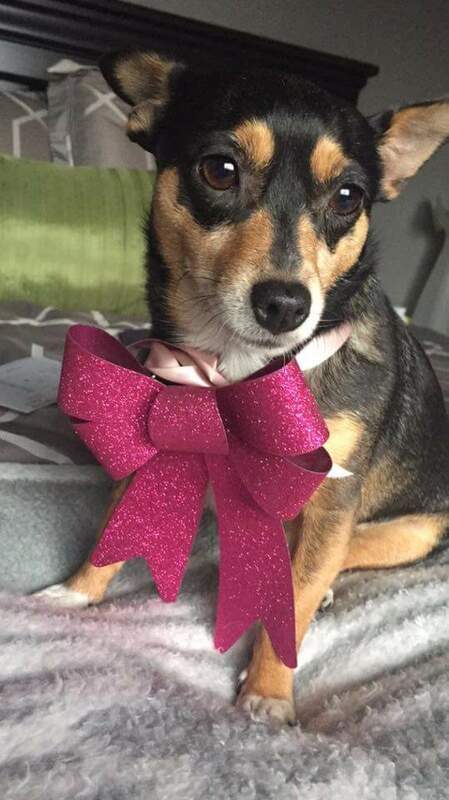 She is not your typical little dog at all and honestly almost every friend and relative proclaims "I've never been a little dog person, but I love this dog". She's a snuggler, a kisser, a sun tanner, a beggar, goofy, smart and seriously sassy. She does this hilarious belly drag with her legs sprawled behind her straight out and tail wagging! She'll belly drag down our upstairs hallway from one room to another. It took us like 4 years before finally getting it on video! I feel guilty because since her we've gotten the cat and another much bigger dog and now the baby. I feel like our first baby has been back burnered a lot. I make sure I give her that extra pat during the day or a sweet hello, but I just feel the one on one time she had before all the others came around is missing. Yesterday I let her sit on my lap while I drove to visit my parents and let her snooze in bed with me while I unwound from the day. I think I'll start doing more of those things to show her she's still my baby.